Alert Bay Lodge’s private rooms include one or two queen beds, soaker tub or shower, and a mini fridge. All have garden views except for the Family Room that offers an ocean view and a covered deck. Our rooms are $130 (single queen bed) to $145 (double queen bed) plus 5% GST. These rates include a hot breakfast for our guests. Wireless is available throughout the lodge. All rooms come equipped with a mini-fridge and fancy soaps. Coffee and tea are served in the Great Room beginning at 6:00 am. We are a small enterprise and, while we are happy to take your reservation by phone, we encourage you to book online. You’ll receive a receipt by email with a confirmation number to present at check in. If you have any questions about our rooms please call us at 1.800.255.5057. Our room prices are based on a maximum of two people sharing one room. Additional guests are $25 per night. Your party can rent the entire lodge. Please look below to our “Vacation Rentals”. 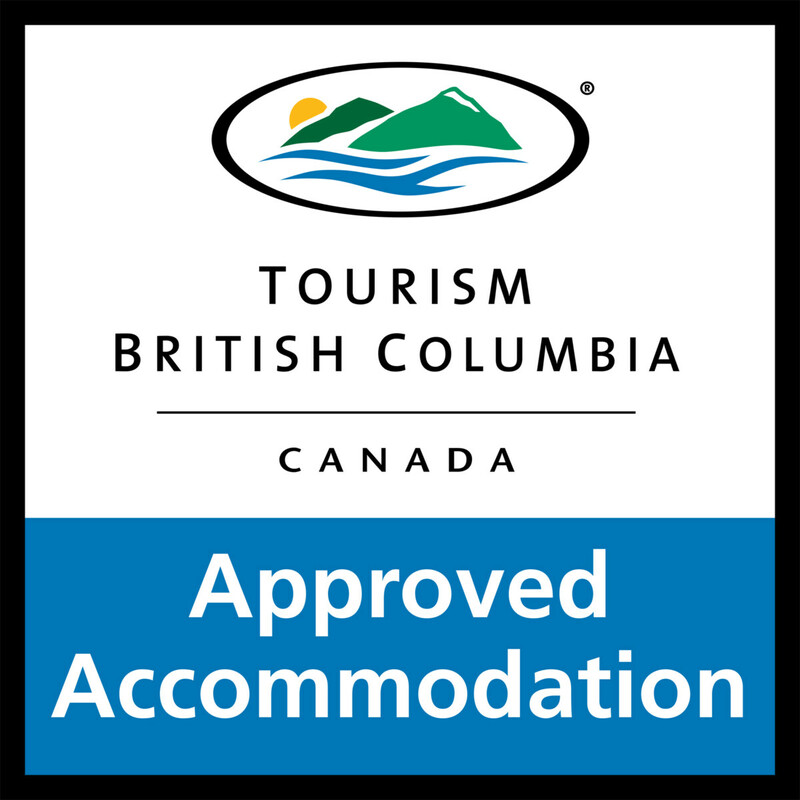 If you are traveling to Alert Bay on business, please inquire about our corporate rate. All rates are in Canadian funds. When your credit card is processed, the transaction should reflect the current rate of exchange for non-Canadian customers. The additional cost of $25 per person is waived for one child under 5 years of age per room. Additional children under 5 years are $25 per night. If you would like to bring your dog, please contact us in advance. As a rule we charge $10 per pet for our pet friendly room. Sorry, we accept only one dog and no cats please. Looking for the perfect west coast retreat where you and your family or friends can relax in privacy? We would be pleased to turn the lodge over to your group! Alert Bay Lodge can accommodate up to 12 people in four bedrooms. Vacation rentals during July and August require a six night/seven day minimum. For all other months, the entire lodge can be rented by the week or month. Our group rates are based on eight people with a per person surcharge up to a maximum of 12 people per night. Please note that our group rates do not include meals. Meal plans are available and special rates are available for work crews. The lodge parking lot can accommodate up to ten vehicles. Larger vehicles can be parked in our second driveway or on Fir Street, across from the lodge. The Great Room of the lodge is available for private functions from September 30 to April 30. The cost is $200 for groups under 21 people and $300 for groups from 21 to 40 people. Payment is required in advance, including a $200 security deposit. A 20% reservation deposit is required to secure the booking. Full payment is required 60 days prior to check-in. If a cancellation is made 60 days or more from check-in, the guest will be refunded the reservation deposit, less a $100 administrative fee. If the reservation is cancelled between 60 and 31 days from the check-in date, or fails to pay the balance due, 50% of the amount paid will be refunded. If the reservation is cancelled between 30 and 0 days prior to check-in, 100% of the total rental amount is forfeited. We require a $500 security deposit. The deposit is refundable once we inspect the lodge and everything is deemed to be in order. A $100 cleaning fee is charged on the seventh day of each week the lodge is rented. This fee is applied to cleaning all rooms and replacing towels and bed sheets. If you require overland transportation for your group please contact Midnight Sun Adventure Travel. This company utilizes vans and SUVs as part of its adventure tours of Canada.